My local bee club, Portland Urban Beekeepers, recently partnered up with Honey Bee Allies to provide a swarm hotline and easier-to-use swarm list for Portland, Oregon. We've had the hotline in place for a month now and having great success with it. One of the great things about it is being able to collect swarm call data. Time to get geeky with numbers. 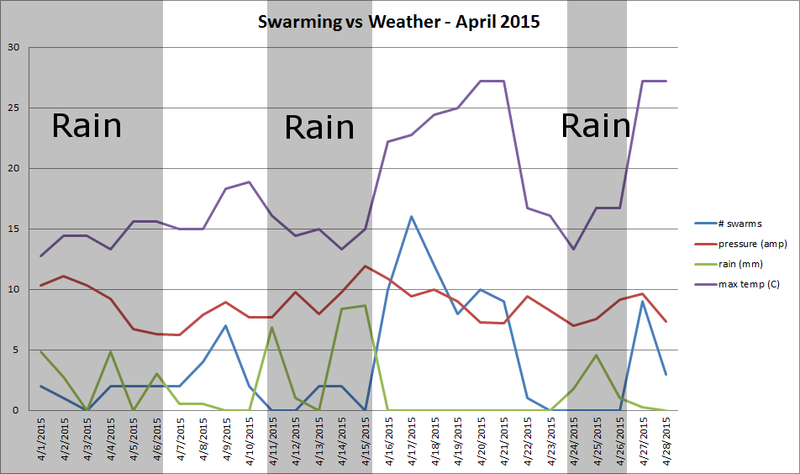 Below is a little something I threw together to show swarm activity vs weather. I wasn't sure which variable would correlate best to swarming behavior, so I included barometric pressure, precipitation, and maximum temperature in the data set. To get the pressure to show up on the chart as anything other than a nearly straight line I applied an amplifier to it (inHG-29)*8. This makes the changes in pressure show up much better as a nice wiggle on the chart below. 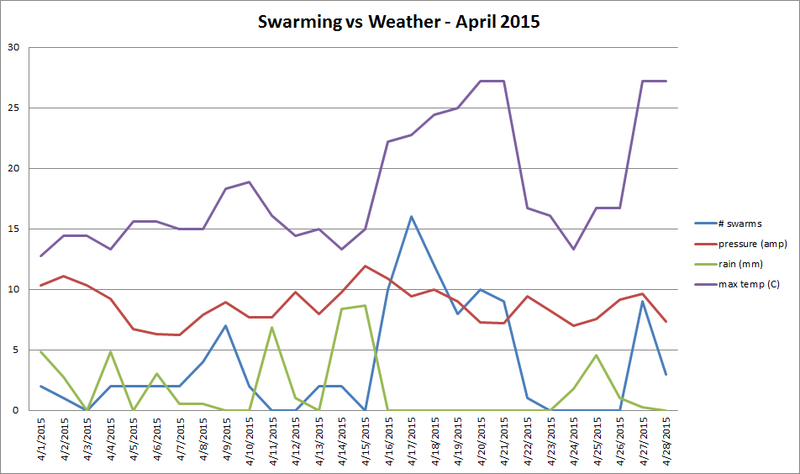 It looks like there's a strong correlation between warm, dry weather and swarming. (Is that a big surprise to anyone?) Not much of a correlation with barometric pressure. Swarming is happening whether the pressure is rising or falling. But there is something interesting happening with the rain. A huge spike in swarms at the beginning of a long dry spell. Are the bees sensitive enough to weather patterns to know when there will be a long period of time to set out and find a new home? Or is this explained simply by the much higher temperatures? Of course, experienced beekeepers around here are well aware of this pattern. It's just interesting to see it in chart form.